Ever since I first started studying properly, I've preferred to get it all the information on one piece of paper so I can get an 'aerial view' of the subject. When I asked Nick Wright to make a poster to encompass the whole of the first chapter of the barista manual, he asked me to come up with a rough outline of what I was after – his job, after all, is making things look pretty, not teaching coffee. I spent a week attempted to force coffee theory into one page. Because the variables interact with one another, I considered the best format to be radial with a cup of coffee like a nucleus surrounded by elections of variables in different shells. Nick rightly thought this to be daft and drew three lines with Immersion, Drip and Pressure at the top. He was right and it was obvious that this was the best way to present the information, after all, the three methods have a lot in common. After several weeks in the crucible of iterative design, the finished poster didn't just encapsulate the first chapter of the book; it forced me to re-write it. 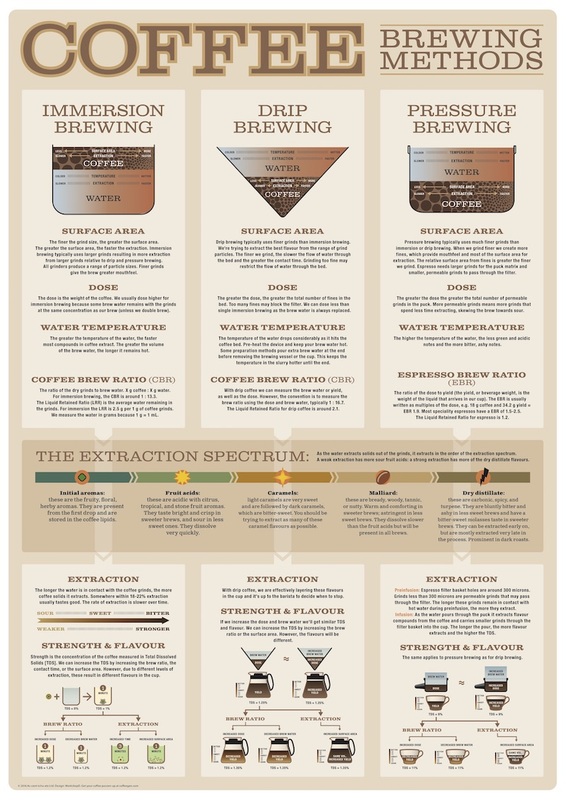 You can get this page of distillated coffeegen in the form of a poster printed in the US of A and sent to wherever you are reading this. By simply putting it on the wall of your cafe, the number of repeat customers for coffee will increase dramatically or, at the very least, it'll cover up the spot where the wallpaper is peeling. The poster is 18 x 24" (457 x 610 mm), which is a bit bigger than A2, and is printed on archival acid-free paper like the fancy ones in the museum. It'll cost you $15 plus shipping.